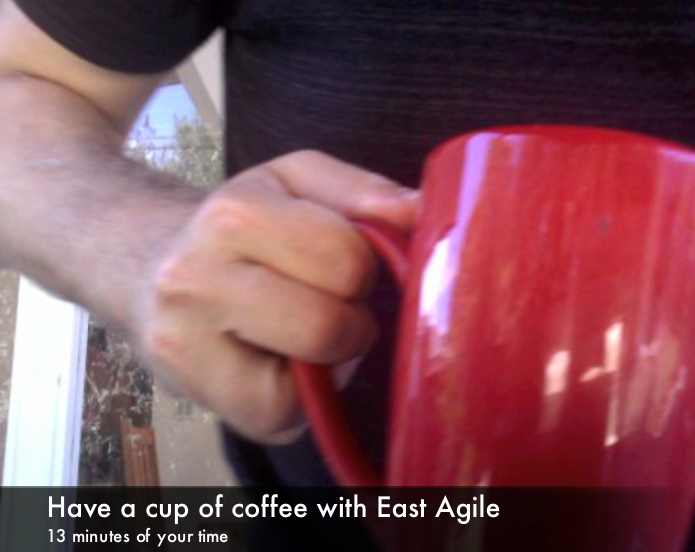 If I were sitting down with you for a cup of coffee, this is what I'd tell you about East Agile, what we can do, and what it is like working with us. It is thirteen minutes long, but I think you will find it very enlightening and really help you get to know us. Can you tell if a site was implemented using Ruby on Rails? It is not always obvious. But there are clues that you can use. One of the East Agile developers shares the following advise on this topic. Basically, I give you 2 simple approaches. To take advantage of these, you may need an understanding of some web technologies and you may need to install more tools. Hal Varian was quoted recently talking about Micro-multinationals as a fairly recent business innovation he has noticed in Silicon Valley in particular - small businesses made up of people spread throughout the world with some key players in the Bay Area. We understand that mode of business well. And working with an East Agile development team is a great way to augment and enable that mode of operation. Socialscore is a dashboard for Facebook users' social networks. The concept is to present meaningful metrics, information, and search capabilities to enable Facebook users to understand their social networks and social influence. The idea (IMHO) was rather cool, but we ended up with under a hundred users and the site was never very successful from a business perspective. However, it does remain a good demonstration of some of our programming capabilities. Recently, we've been doing a lot of analytics work for clients with social networks and games on mobile platforms ranging from basic phones using SMS to iPhones. The focus in these cases involves discovering the drivers behind customer behavior and developing viable business models against a rapidly changing competitive landscape. Our onsite PhD analytics guru, Tim, has been really key in making this part of our business work, supported by the rest of the offsite team at East Agile. Tim carries some pretty powerful tools in his belt, which includes Hadoop on EC2, SAS, and some special joint-entropy optimization tools. After several weeks of initial development by Pivotal Labs in San Francisco, East Agile has provided some additional support and helped Laura Fitton's oneforty application during the transition to its own development team. Ben, one of our developers, has just left East Agile. He was poached by Google and will start work in their New York City office in a few weeks. That's a real loss for us.On the other hand, I'm rather pleased to see that the likes of Google think so well of our people.